Home Remedies to Turn White Hair Black without Chemical Dyes ! Black tea is a natural dye that will make hair darker. 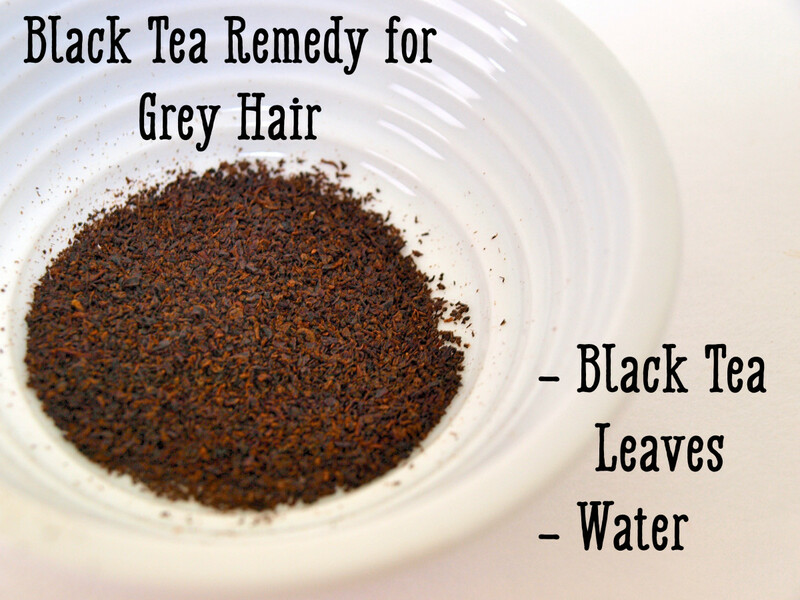 Black tea works best with prematurely grey hair, and is simple to make—you only need two ingredients. You can leave the tea in for up to two hours, or you can leave it in for less time and apply it more frequently. The amount of times you use this black tea rinse will have a cumulative effect—the more you do it, the more of an effect you will see. Boil the tea leaves in water. Strain out the tea leaves, then apply the tea to your hair. If you have long hair, one of the easiest ways to apply the tea is to pour it into a small spray bottle. Spray the tea into your hair and brush to make sure that the tea is spread evenly. After roughly an hour (you can go as long as two hours), rinse the tea out with cold water. Do not shampoo. Sage can also be used to make an effective natural dye to hide grey hair. 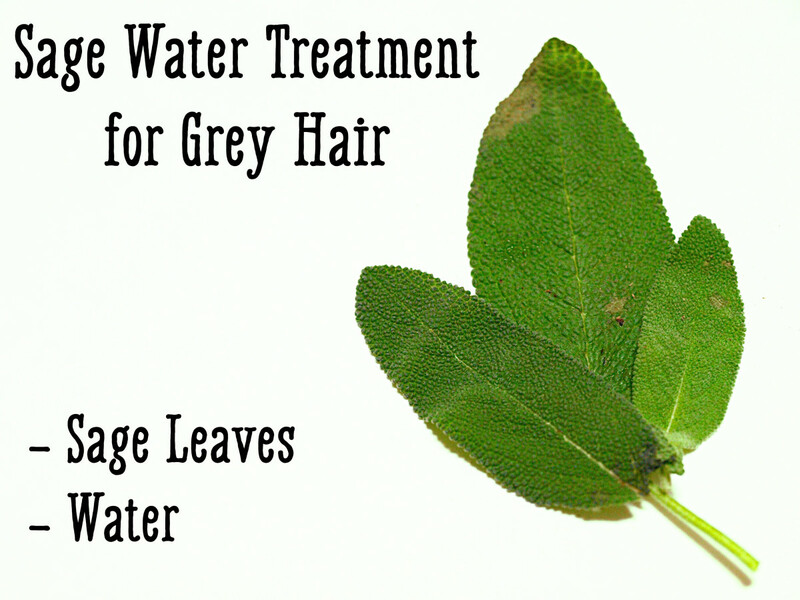 The herb sage is one of the most effective remedies for grey hair. It both stops the growth of grey hair and restores natural hair color. Boil the sage leaves in water. Remove from heat and allow the tea time to cool down. Spray the room-temperature liquid all over the hair. Allow it to sit for two hours. Wash with mild shampoo or soap. This will add a bit of color each time you use it to wash your hair. Use this remedy for few weeks, and the results will be visible. 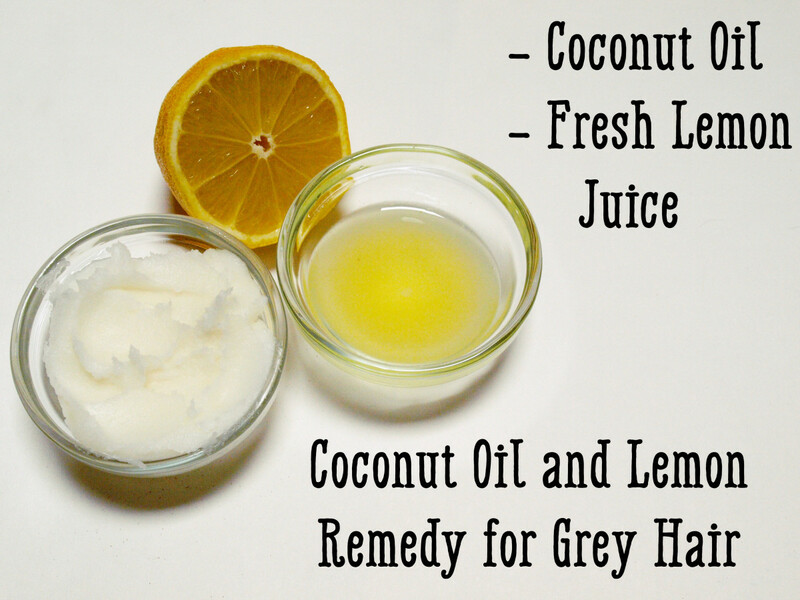 Coconut oil and lemon juice will nourish your hair and leave it dark and shiny. This effective recipe uses ingredients you may already have in your kitchen. It should be used at least twice a week to make hair black, soft, and shiny and slow the graying process. Mix the coconut oil with the fresh lemon juice. Gently massage it into your scalp, then comb it through the entire length of your hair. Wash it out with mild shampoo or soap. 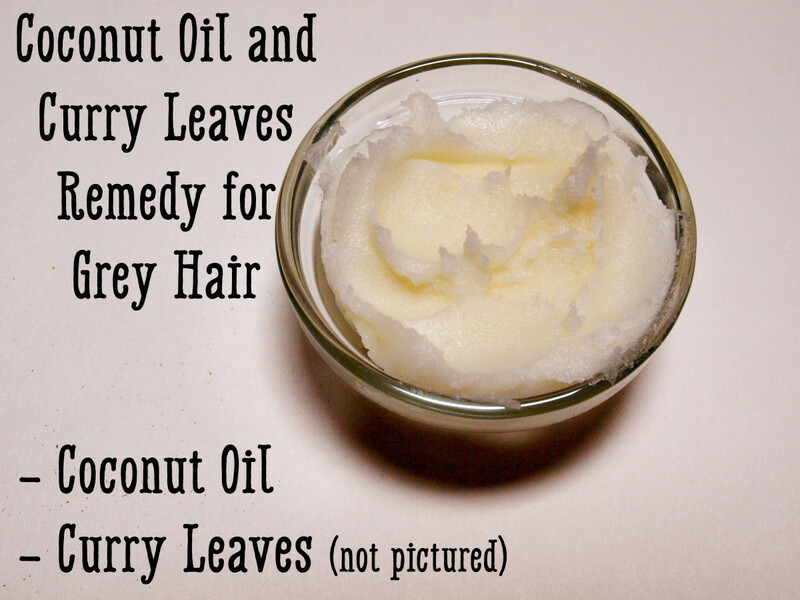 Curry and coconut leaves can be used to promote the production of melanin and keratin. This is the perfect remedy for young people with premature grey hair. Boil the curry leaves in coconut oil. Strain out the leaves, then allow the coconut oil to cool down to a temperature that will be comfortable to apply. Massage the curry coconut oil into your scalp and allow it to sit for up to an hour before washing it out with with soap. This remedy effectively restores the melanin pigmentation in hair. Soak the dry pieces of ribbed gourd in coconut oil for three days. Boil the mixture until a black residue is formed. Massage it into your hair and leave it in for an hour. Henna and coffee work together with other ingredients in the recipe to dye your hair a darker color. Henna is a classic natural hair dye. This recipe should be used twice a week for soft black hair. Use a plastic, wooden, or stainless steel bowl, because the henna can react to certain metals. Mix the henna powder with as much coffee powder as desired (the henna will result in a reddish color; the coffee results in a more brownish color). Add the curd, lemon juice, catechu, brahmi, Indian gooseberry, and dry mint powder. Add vinegar until it makes a thick paste. Let the mixture sit for two hours. Apply the paste onto your hair. Leave it in for an hour. Rinse out the dye completely with water. 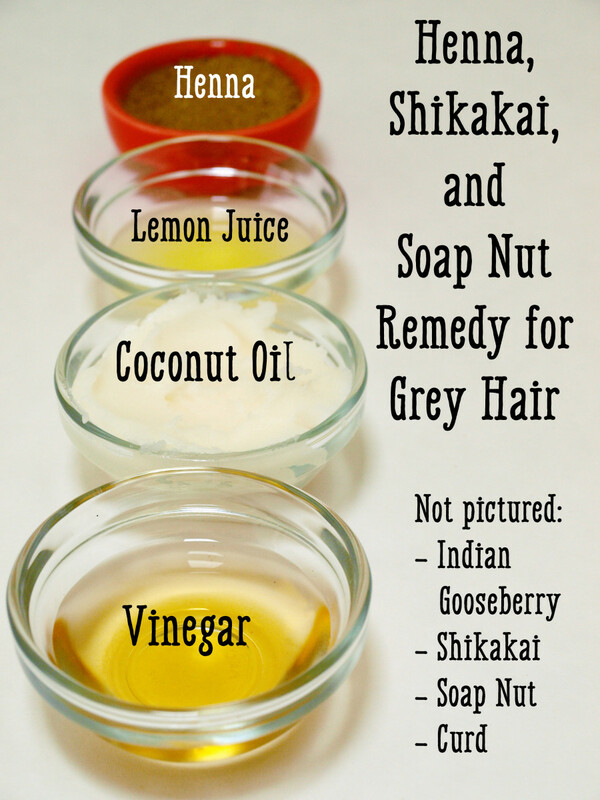 This hair pack is one of the most effective home remedies for gray hair, and it’s perfect if you don’t have all of the ingredients for the recipe above. This pack dyes hair and leaves it soft, silky, and shiny. Prepare a fresh henna paste and add the gooseberry and coffee powder. Mix until you have a uniform paste. Add water if necessary. Apply it evenly throughout your hair. A shower cap can be helpful to prevent the dye from dripping. Let it remain for two hours. When the two hours are up, wash out the henna completely with a mild soap or shampoo. 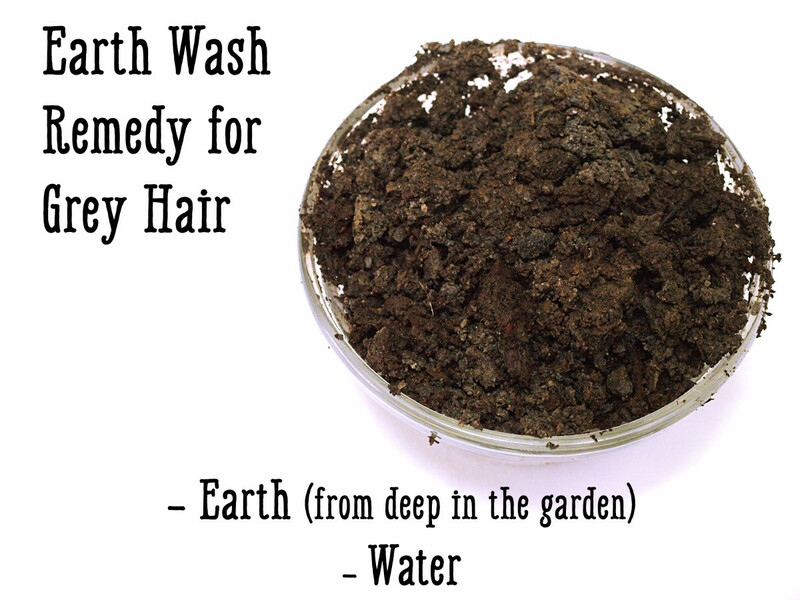 This earth wash grey hair remedy uses ingredients right out of your backyard. This natural remedy requires nothing but the earth from outside. It slows the greying process, has no side effects, and is also good for headaches, sleeplessness, and eye inflammation. Add some water to your earth to make a solution. Filter the solution through a sieve, cheesecloth, or coffee filter and wash your hair with the extract. Use the remedy once a week for soft, strong, and black hair. Henna and Indian gooseberry grey hair remedy. 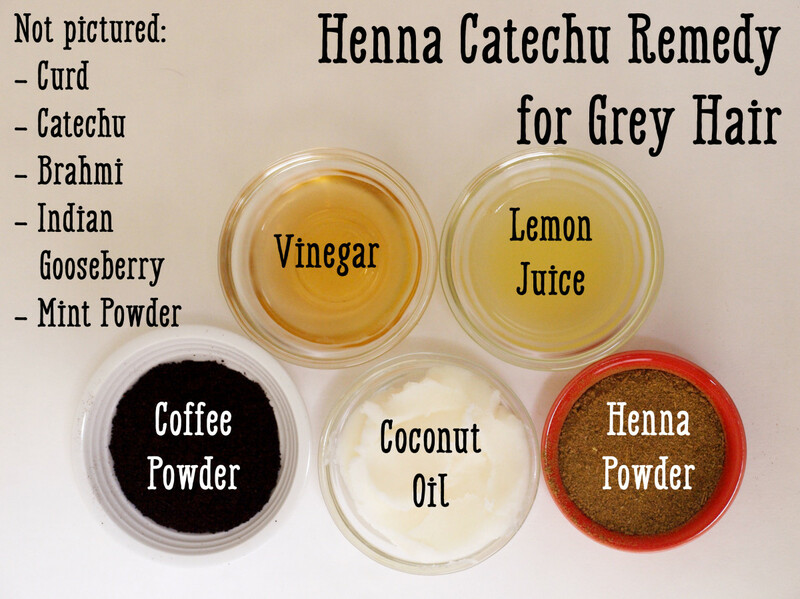 This is another natural herbal henna dye. It’s best to use an iron bowl while mixing these ingredients, as the iron oxidizes the contents and makes the dye darker. Combine all ingredients in an iron bowl. Mix it until it forms a paste, and leave it in the bowl overnight. Apply the paste on hair in the morning. Let it sit in your hair for two hours. If you do not have all of the ingredients for the recipe above, try this alternative. This remedy makes the hair shiny and soft and is best applied in the summer. It stops and retards the process of hair whitening. 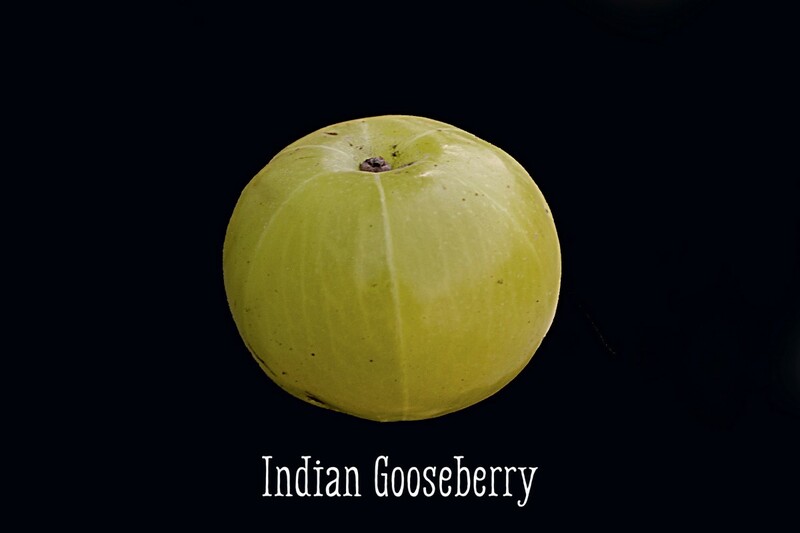 Combine the Indian gooseberry, shikakai, and vinegar to form a paste, and let it sit overnight. If the herbs are not powdered, break them into small pieces and soak them in the vinegar overnight. Mash the contents in the morning to form a paste. Massage the mixture onto your scalp and throughout your hair. Let it sit for 15-20 minutes. Wash out the rinse, then apply the coconut oil to dry hair. With repeated applications, your hair will become strong and black. Sesame seeds are full of nutrients necessary for melanin and keratin production. 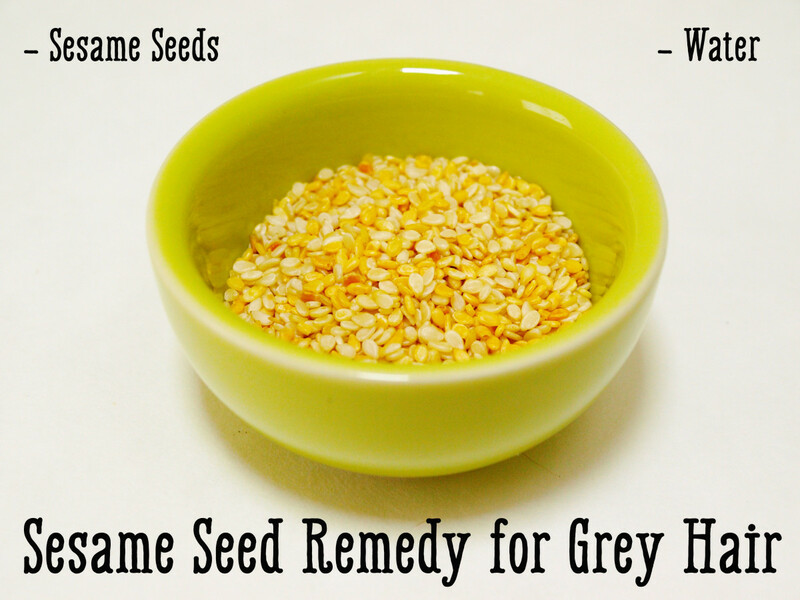 If available, choose black sesame seeds for these remedies. Because they have not been hulled, they retain more nutrients than white sesame seeds. However, both are rich in trace minerals and vitamin B. This remedy will reduce hair loss and turn white hair black. Soak the sesame seeds in water to make them soft. Use a food processor to mash them into a paste. You can also do this with a mortar and pestle, but the food processor is much less effort. Apply the resulting paste to the scalp and throughout the hair with gentle massaging movements. Both sesame and shankhapushpi (Latin name: Convolvulus pluricaulis; also known as English speed wheel) are excellent for hair. 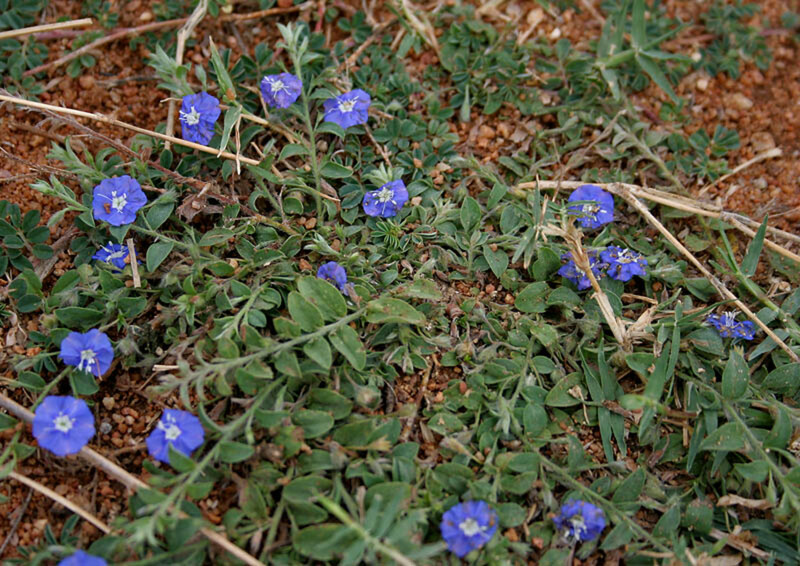 The shankhapushpi plant has white or light-blue flowers, and is found 1800 meters above sea level. It is used to cure thyroid problems, epilepsy, and coughs, and it is said to improve memory. Boil the roots and leaves of sesame plant and wash the hair with the extract to turn white hair black. Another option is to buy the readily available black sesame oil. Boil it, and, when it returns to a temperature that is warm but not hot, massage it throughout your hair to slow premature greying. This will also keep the hair soft, black, and dense. Prepare shankhapushpi oil in the same way (by boiling it and allowing it to cool to a comfortable temperature). You can also use oil from the dwarf morning glory (Latin name: Evolvulus alsinoides). The regular application of these oils turn white hair black. This remedy will turn white hair black in a few days. Apply the mixture throughout hair. ← 5 home remedies for Grey Hair that NEVER work !